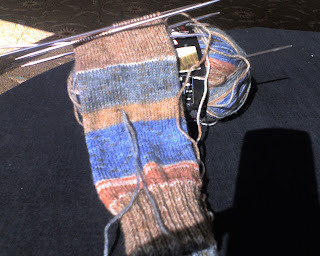 This is my Sock In Progress - back on the road with me again. Austermann Step "mit Aloe Vera und Jojoba Ol." There will be no livin' with me, now that I've figured out how to post these crap-tastic pictures from my Treo. Only three hours in, and I am already sitting feet-up in the relative calm of the hallway, wimpering over an extra large triple-shot mocha. But no whipped cream, please - I'm on a diet. Photography is forbidden on the market floor, so you'll have to just envision a crush of knitters, crocheters, spinners and weavers swarming booths jammed to overflowing with pure Awesome. It's worth getting over any fear/dislike you may have around crowds. I got some beautiful stuff, and some cost-effective stuff, and some whimsical stuff. Since nobody has the Baby Ull that was on my shopping list (or anything comparable at a reasonable 'gift for coworker's Impending Arrival' price-point) (if the price is right, the yarn is wrong; if the yarn is right, the price is GAH!!!! ), I think I might be about ready to wrap it up and head home. I think there might be a law about leaving it in my wallet. After all, when I entered the withdrawal in Quicken, I clearly categorized it as Yarn:Personal. I think Quicken automatically reports that to the IRS. Yeah. Better get back in there and keep things honest.